Pictured are Rep. Gary Mohr (R-Bettendorf) and members of the Pleasant Valley Robotics Club. 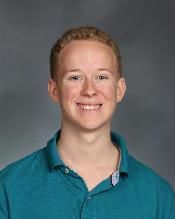 Justin Hettlage, Bettendorf, has scored a 36 on his ACT test. A junior at Bettendorf High School Hettlage's score is the highest composite score any student can earn. Abby Kurth, Bettendrof, a senior vocal performance major and theatre minor in the Glenn Korff School of Music at the University of Nebraska–Lincoln, was awarded 2nd place in the 2019 North American Vocal Competition sponsored by music publisher Hal Leonard. More than 1,000 student entries were received in this year's annual competition. Kurth's award was in the collegiate music theatre category for male and female young adult voices, and she was judged the highest-scoring female singer in the competition. Kurth will be featured in the title role in the upcoming musical, "Violet." She has been involved in several UNL Opera productions as well as singing with the UNL Vocal Jazz Ensemble and working as an education and events intern at the Lied Center for Performing Arts. This past summer, she was a member of the 2018 Ohio Light Opera Company and performed in six different productions during the summer. Olivia Gasper, Bettendorf, has been named to the cast and creative team for Iowa State University Theatre's spring musical, "Godspell." Evening performances will be 7:30 p.m. Fridays-Saturdays, April 5-6 and 12-13 with matinee performances at 2 p.m. Sundays, April 7 and 14. Recently, Rep. Gary Mohr (R-Bettendorf) welcomed the Pleasant Valley Robotics Club, the Winter Soldiers, to the Iowa House of Representatives. Elaine Andorf, Bettendorf, performed with the Cornell College Jazz Ensemble during a concert held Friday, March 29 at the college in Mount Vernon. The group worked with the Cornell College swing dancing club, Slick Shoes, to make it a night that included both dance and music. The Cornell College Jazz Ensemble is an auditioned Big Band of approximately 20 musicians with the traditional mix of saxophones, trumpets, trombones, guitar, piano, bass, and drums, supplemented occasionally by other instrumentalists and vocalists.